Fortunately, we have many records of some of the men who worked at the mill over the years. This is almost unique amongst mill organisations, many of whom know very little of the early history of their mills, or of those who worked there. THOMAS HINKLEY the first miller at the Cranbrook windmill, after Henry Dobell. He was one of twelve children of William Hinkley, a local miller of Cranbrook, and of his wife Hannah (nee Westmore). Thomas was christened on 7 March 1798 and grew up immersed in milling lore. So it is not surprising that we find him, as a young man, having completed his statuary seven-year apprenticeship, working as a journeyman miller in Hawkhurst. However, after his marriage in 1829 to Hannah Goodsell at St Dunstan's Church, he moved to Cranbrook. Here he became the miller at the windmill for the Union Mill Creditors Company. 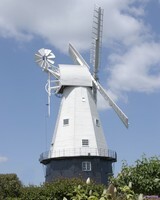 Thomas continued to be employed as miller by John and George Russell after they bought the windmill in 1832. Thomas and Hannah were non-conformists, like many Cranbrook residents, and worshipped at the little Chapel which still stands near by, lower down The Hill. They first lived in Mill Cottage [now known as Mill House] and brougnt up five children there. Then they moved across the road to the larger house on the Hill which, at the time was divided into two residences. However, Hannah died in the late 1840s and their eldest daughter, Caroline (aged just 15) acted as housekeeper to her father. His three sons, Thomas junior, Edward and William were also described as millers but did not necessarily work at the Union Windmill. When his daughter Caroline married a few years later, her younger sister Elizabeth, replaced her as housekeeper. On 24th January 1843, Thomas Hinkiey was involved in an incident which could have had fatal results for both him and the windmill. Just after midnight, a fire broke out at a bacon drying house, part of the grocery of William Scudders, on the right of the entrance to the mill yard, near which there was also a carpenter's yard containing much timber and some gunpowder, too. The alarm very soon brought a fire engine, together with a large crowd of bystanders. The presence of the gunpowder stopped anyone from approaching too near though in spite of tne proximity of the vulnerable windmill. However, Thomas Hinkley, fearlessly ran in and removed the gunpowder to safety and allowed the fire to be contained, at a total cost of under £50 and just one casualty, a man having fallen into the pond while dipping for water! A brave man was Thomas. Thomas Hinkley worked as miller at the windmill for a total of 37 years until April 1867, when he retired at the age of 69! He had seen a lot of changes at the Union Mill during his lifetime: the conversion from common sails to Patent sweeps, from hand winding with the Y-wheel to a fantail, and the gradual introduction of steam power in a series of engines, which eventually superceded wind power. Finally, the inevitable cessation, in 1870, of flour milling by wind. We can imagine that all these changes, brought about to make the business profitable, were nonetheless not always to the liking of the old man. Was it that which drove him eventually to retire? However, soon after, in 1871, at the ripe age of 73, Thomas Hinkley died. Unfortunately, we do not know who filled the post immediately after Thomas Hinkley retired, but ten years later, in 1880, when Frank was just in his twenties, he became foreman miller for the elder John Russell's son, Ebenezer. (This may appear to be very young for such a responsible position, but Henry Dobell took on the milling when he was just 23.) 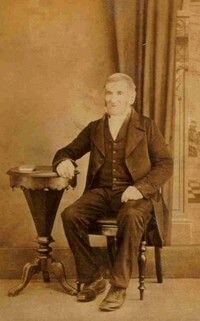 After Ebenezer died, Frank continued to serve his son, Hugh Russell. Then, in 1898, while Hugh visited Australia, Frank moved to Slipmill, the family watermili in Hawkhurst, and was in sole charge there for three years. After Hugh emigrated in 1902, Caleb Russell took over from his brother, but he being a watermiller at heart, moved the main business to Slipmill and Frank Reeves returned to the Union Mill in Cranbrook. During Caleb's ownership the windmill deteriorated badly, which must have troubled Frank and the arrival of John Russell in 1918, on his father's death, was probably a great relief to him. For Frank wholeheartedly supported John in his determination to get the mill back to work and in the restoration John undertook. 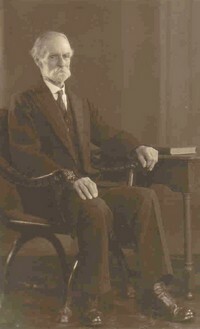 Frank Reeves was a tall, slim man with a full beard and moustache, very upright in bearing even in his old age. His long experience and extensive knowledge of the mill made him invaluable to John Russell. He and Frank were often to be seen deep in conversation, contemplating the weather and noting the movement of the clouds, wondering whether they would have enough wind to work the top stones. John made many favourable comments about his foreman and friend in his numerous letters, where he admits that he relied on Frank to a very great extent and often took his advice. Frank Reeves married his wife, Ellen, (who came from Ticehurst) in 1880, and she bore him several children. One daughter, Priscilla, died unmarried at the age of nearly 100! A younger son, Charlie Reeves, also worked at the Union Windmill, until the mid-1950s, but was never the miller. Other sons also took up milling as a trade, but are not known to have worked at the Union mill. Frank Reeves stayed on into his late seventies and eventually retired in 1940 but spent many hours during his retirement still pottering around the mill he had served for so long.